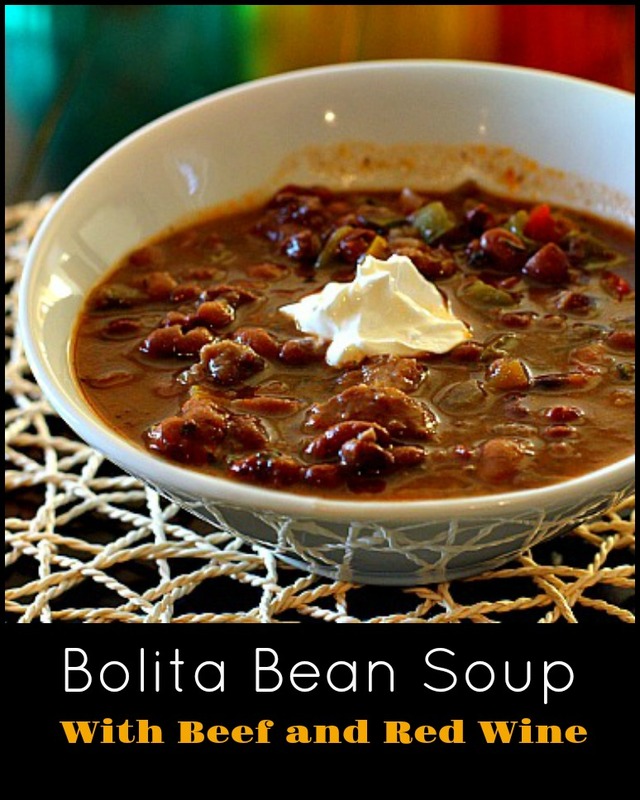 Give Bolita Beans a try with this bearty Bolita bean and Beef Soup. Spoiler alert, there’s red wine involved for a special complex flavor. Inspired by a snow storm, this soup made excellent use of that remaining half bag of Bolita Beans in the pantry. 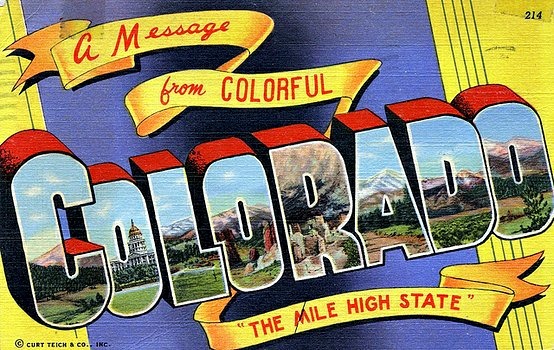 I buy dried Bolita Beans from the farm markets east of Denver. Bolita Beans are grown in Colorado in the Southwest Corner of our state and distributed by Adobe Creek Milling. If you can’t find them, I’ve provided an Affiliate Link for your convenience. But what’s the difference between Bolita and Pinto beans? Bolita vs Pinto, They look similar to Pinto beans, a bit smaller and creamier in texture and they seem to absorb every single spice flavor you cook them with. This soup relies on red wine to boost the flavor. The recipe would also work well with Kidney, Calico, or Pinto Beans. One cup of beans will yield two cups of cooked beans. This time I cooked just shy of two cups dried beans with about five cups of water and a heaping tablespoon of lard in the crockpot all day. Soft and aromatic they were ready to be added to the lineup of ingredients for this soup. Hearty, stick to your ribs and packed full of flavor. As the soup simmered on the stove top, Kim with Roamin’ Baths, our mobile groomer, set up shop out front to clean up the pups. This is puppy Remy’s first groom and he came through with flying colors. Didn’t seem any worse for the wear. And speaking of coiffed dogs, we attended the Denver Dog show last Saturday at the National Western Sports Complex and I took some photos of the contenders. This is my favorite shot of the day. It’s in need of a great caption. A trip to the dog show wouldn’t be complete without a visit to the Cattleman’s Grill. 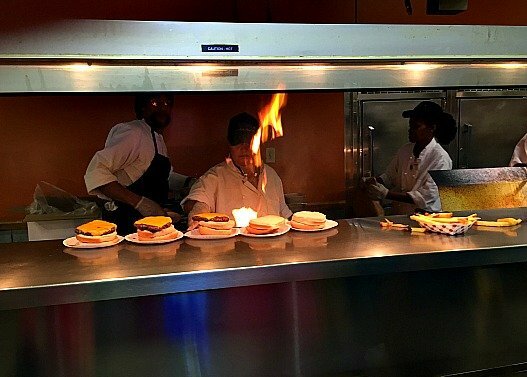 You stand in line with your plastic tray and grab a cheeseburger that’s hot off the flaming flat top grill. The cafeteria style restaurant, located inside Denver’s National Western Stock Show Complex, serves an array of Western and BBQ food and seats quite a crowd. Grab as many dill pickles as you can teeter on the small flimsy paper plate and find a seat at the family style tables. Complete with plastic checkered table cloths it’s a great lunch. Sour cream or plain yogurt for garnish. In a 10 inch skillet, melt the butter over medium heat. Add the onion and sauté until soft. About 3 minutes. Add the bell peppers and celery and sauté another 3 minutes. Stir in the garlic and cook until fragrant. Remove from heat and stir in the beans, honey, Pickapeppa or Worcestershire sauce, bay leaf, summer savory, basil, cloves, hot pepper, salt and pepper. Toss the cubes of steak with flour and shake off access flour. In another large skillet, heat 3 tablespoons of oil and brown beef on both sides. In a large heavy stock pot, bring the chicken stock, wine, tomato paste to a boil. Add the browned beef and simmer on low for 30 minutes. Stir in the bean mixture, turn down heat to very low and let simmer partially covered until the flavors are blended. About 30 minutes. Taste and adjust seasonings. Serve garnished with a dollop of sour cream. Bolita Bean and Beef Soup with Wine …It’s what’s for Dinner. Never heard of bolitos. 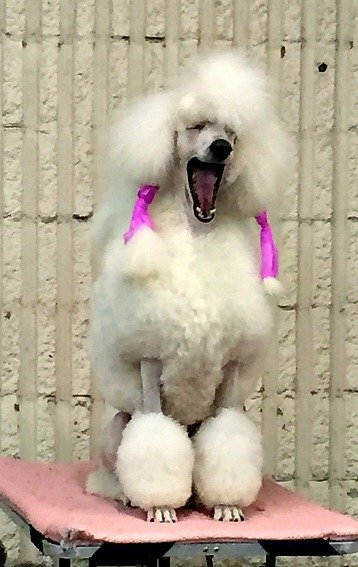 You are so right…that poodle needs a caption. I’m glad I’m not the only one who’s never heard of bolito beans. But if they are anything like pintos, they must be delicious. This ole southern gal thinks beans are the perfect solution to miserable weather. Take care Lea Ann and stay warm. P.S. The doggy pictures are precious. Growing up in the middle of Kansas, my mom somehow had some Southern influence that she passed along to me. I’m with you about beans and soup for perfect comfort food. Your soup looks delicious and has some interesting flavors in it – I’ve not heard of Bolito beans so I’ll go research them. That’s pretty nice having the groomer come to you and a clever business plan by the owner. looks like a fine place for lunch – a cheeseburger with mustard and dill pickle used to be my favorite until I was exposed to Bev’s super burger. It is nice having the groomer come to us. We’ve been using her for over 10 years. 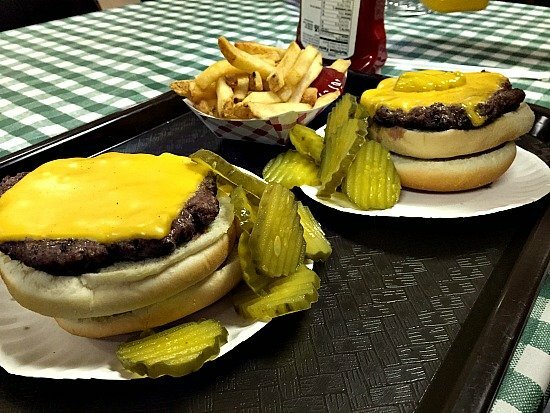 Growing up I always ordered my burgers mustard only … because my Dad did. 🙂 ok, what’s this about a super burger. Heading over to your blog to do a search. Lea Ann, I have trouble cooking dried beans at my altitude – guess I can just substitute canned. Sounds like a delicious, hearty soup. Snowing hard all day on top of the 9″ overnight. My crew is skiing. Guess what I have in crock pot – pork barbecue using your chicken barbecue recipe. It’s a hit with my family. I never thought of beans and altitude. Interesting. You bet, use canned. 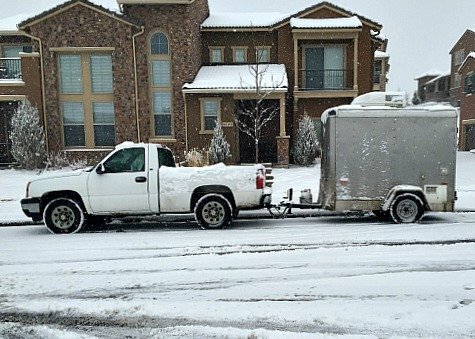 We’re getting snow in Denver, about 8 inches and counting. Perfect crockpot weather. And love that you used pork. I’ll have to try that next time. OK. Now I’m going to have to pick up a bag of Bolito beans. This looks … stick to every damn one of my ribs good! And I appreciate (much more than you could know) your use of Pickapeppa sauce. Wow! Pickapeppa is a soup’s best friend. Love that stuff. Oh, that precious little Remy, he is so cute! I’d like a cuddle with him and a bowl of this soup. Stay warm! Thanks Karen, much cuter groomed. He was getting a little messy. This post had me smiling…cute little Remy, burgers with mustard and lots of dill pickles and of course your bean and beef soup. I’m another fan of Pickapeppa sauce. I’ve never heard of Bolito beans before, but from your description they sound pretty great! This soup looks hearty and tasty! Thanks Amy. Bolito Beans may be a Colorado/New Mexico thing. They sure are good. 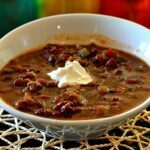 Love this recipe – beans are such a great guilt-free comfort food. Can’t wait to try this. I love the name ‘Roamin’ Baths’! So cute and so is Remy 🙂 Your beans and beef sound so tasty with the red wine. 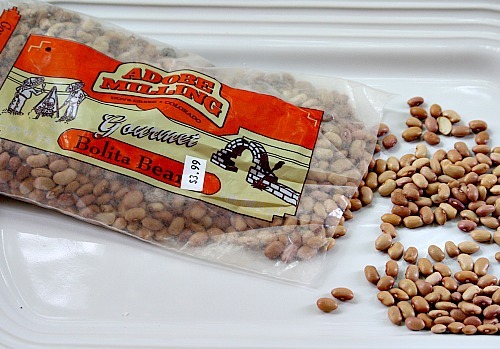 I never see bolito beans in my supermarket, although they’re in some Italian markets I visit. This looks like a great soup. And we haven’t had as much snow and cold as you’ve had, the weather here has been nasty. So we’re eating soup, soup, and more soup. Can always use another recipe. 😉 Thanks! Odd, I think of Bolito beans as a Mexican/Southwestern type bean. At least you can find them. I really like em. You are right. There is no way you could miss stopping there. Your pup is adorable by the way! I wish I had one of those burgers right now. I think we were on the same wave length a few weeks ago. I went to the dog show on Saturday, too. I made a bean soup last week, And soon I am posting a recipe with pick a peppa sauce and shrimp. You sure know how to rock! GET OUT! What if we ran into each other an didn’t know it. And a note about that pickapeppa … it’s my secret ingredient. Love the stuff. Lea Ann, unlike my husband, I love beans. 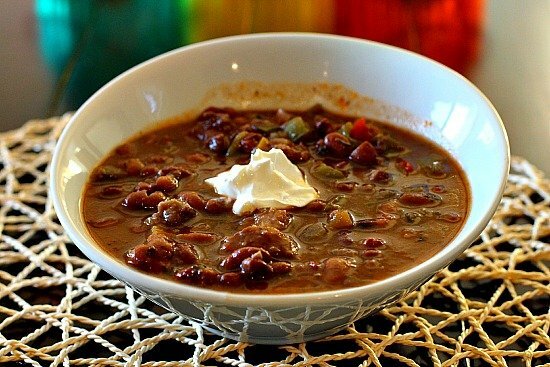 And this soup looks fantastic–even my “no beans” guy is going to love it! Pinning now. Thanks for that Pin Jean. And what are we going to do with that “no beans” hubby???? Oh dear, I think I’m going to have to have a burger and fries for lunch now! 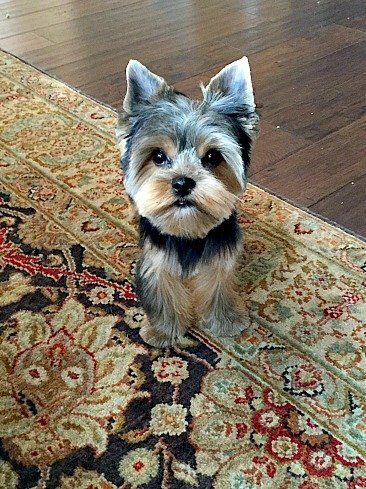 Your pup is absolutely adorable…. 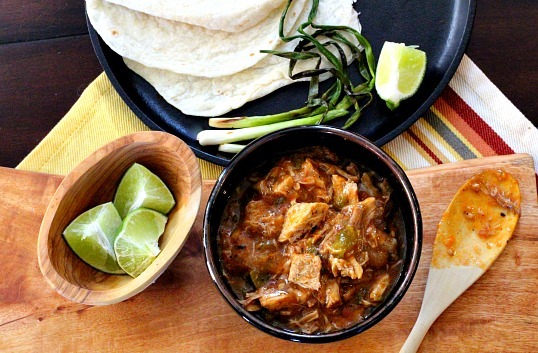 This looks truly tasty and hearty in the face of our upcoming snowstorm… Thanks!